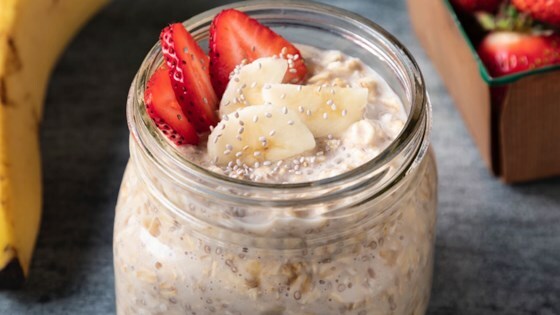 "Nutritious and easy, these overnight chia oats can help jumpstart your day. Customize by adding your favorite toppings and almondmilk flavor." In pint jar with lid, place all ingredients and shake. Cover; refrigerate at least 8 hours or overnight. Easily swap Almond Breeze Almondmilk 1:1 for any recipe that calls for dairy milk. Feel free to substitute in your favorite Almond Breeze almondmilk flavor (Original, Chocolate, Unsweetened Original, Unsweetened Vanilla, Unsweetened Chocolate, Blended with Real Bananas, Coconut Almond blend, or Cashew Almond Blend). I make with any fruit I have on hand. We like to heat the mixture from the jar to a bowl in the microwave for breakfast. It is very nourishing and good. It tasted just fine but the texture of the Chia seeds are different. I'm eating while reviewing it. It is wonderful, my husband loves it too. It's easy to make, great tasting, and healthy. Super Easy and SUPER GOOD TOO! 5 stars!